I've been going to QCon conferences for a number of years, at least from 2008 onwards. I've spoken on a range of things, from REST through transactions to the future of Java. And throughout those years QCon has never failed to be a stimulating place with people who want to cut through the hype and get to the real problems. In short, it has always been a great place to visit as well as present at. However, it's also been a relatively small venue, which helped to foster that almost 1-on-1 interaction with people that stimulates good discussion. Until this year! I don't know what they did, but QCon London 2012 was huge and yet still manages to retain the same feel as in previous years! 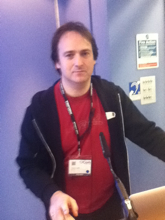 I'm just back from giving a presentation (Is Enterprise Java ready for Mobile and Cloud?) and it went well. There was a lot of interest and according to the feedback I got, 92% of the audience thought it was good The presentation and video will be up eventually and I'll try to update this posting when that happens. The entire track that I was within (the Solutions Track on High Performance Systems) was very well attended and had interesting talks. For instance, I'm an F1 fan but this is the first time I've been in a presentation where someone managed to show how DevOps can learn from the F1 teams! Funny but very informative. I'm looking forward to presenting at future QCon events. However, if you've never been to one before then I definitely recommend them! Last year I mentioned that JBUGs are really important to us and that we were starting to make some changes to improve the way we work with them. Well I can now announce some more things that are happening around JBUGs. For a start we are launching a series of JBUG leader calls with the JBoss core teams. Initially due to timezone constraints this will be restricted to North America, Latin America and Europe, but I hope we can offer this around the world soon. The calls will be at 12pm Eastern on the first Monday of each month, and each call will include a JBUG-focused technical presentation about some topic of interest, previews of things to come etc. During the call the JBUG leaders will be able to tell us what else we can do to help them out as well as ways in which they can collaborate. At the moment JBUGs rarely get to help each other, so we'll be looking at some online forum or mailing list where they can chat and tell each other what works and what doesn't work. What qualifies you as a leader? Well if you regularly help in putting together a JBUG then you're a leader. And it doesn't matter if you are a JBoss/Red Hat employee either - you can still attend. The first meeting is on the 5th of March (yes, it's close!) And in that call we'll be talking about AeroGear. The next meeting, on the 2nd of April, will be about the JBoss Developer Framework and DeltaSpike. And during that meeting we're planning on providing some discounted access to JUDCon for JBUG leaders, so you definitely don't want to miss it! So how do you get involved? Well first of all you should sign up to the JBUG pages. Next you should start to follow the @JBossUG on Twitter. That account will provide us with a way to communicate. Hopefully everyone will find this a useful start to more improvements we'll be making to and for JBUGs in the near future. So come and get involved and help us shape this future. It shouldn't come as much of a surprise to anyone here given our efforts around Cloud, mobile and JBossEverywhere, but recently we introduced what I'm tentatively calling JBoss3D, or the Three Deployments. Essentially this means that from now on all of our projects will consider the three different types of deployment environment whenever developing new capabilities: mobile, cloud and traditional. Of course many of our projects have been doing this for a while, and others have started to think about it. But I wanted to formalise this so that everyone understands that our future relies in a range of environments. So if you're in the community as a contributor or user, then please help us make this a success!